I finished this commission today. Soft pastels and pastel pencils, on Uart 400 pastel paper. Thanks to Shauna Dolby for the reference photo, some changes made due to customer request. For Sale: $40.00 plus shipping if not picked up in Lloydminster, shipping is approx. $5.00, this is matted; but NOT framed. Click on photo to see full size. Perfect for a childs room. Size: matted to 14 x 11 inches, NOT framed. For Sale: $40.00 plus shipping,(approx. $5.00) if not picked up in Lloydminster. Soft pastels on Uart 500 pastel paper. Size: 12 x 18 inches, matted to 16 x 20 inches. NOT FOR SALE. COMMISSION PAINTING FOR CUSTOMER. ACEOs (Artist Card Editions and Originals) or ATCs (Artist trading cards). Click on photo to see full size. Soft pastels on Uart pastel paper. Size: 2.5 x 3.5 inches, each comes with its own tiny easel. For sale: $3.50 each or all 3 for $10.00, plus shipping if not picked up in Lloydminster. A cute way to own original artwork for a low price, perfect size for the tiny space that needs something. The 2 landscape ones are sold. The Lamb is still available for purchase. Size: 12 x 8 inches, not matted, not framed. For Sale: $30.00 plus shipping if not picked up in Lloydminster. Photo reference thanks to Kim George. Size: 4 x 3 inches, comes with its own little easel. For Sale: $5.00 plus $5.00 shipping if not picked up in Lloydminster. Soft pastel and pastel pencils on Uart pastel paper. Size is 14 x 11 inches, matted to 20 x 16 inches. Size: 10 x 8 inches. For Sale: $30.00 not matted, not framed. Plus shipping if not picked up in Lloydminster. Soft pastel and pastel pencil on Sennelier pastel card. Size: 7 x 5 inches, matted to 10 x 8 inches, Not framed. For Sale: $20.00 plus $5.00 shipping if not picked up in lloydminster. 11 x 14 inches on Uart 500 pastel paper. Soft pastels and Faber Castell Pitt pastel pencils.The customer will mat and frame it herself to match the other two, that I did for her last fall. 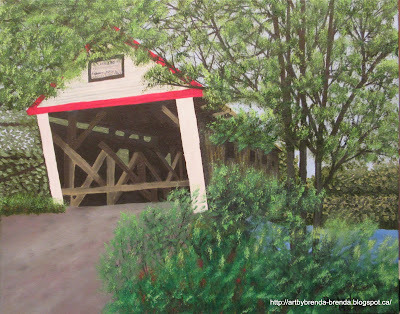 Title: Lovejoy Covered Bridge, Andover, Maine. For Sale: $110.00 plus shipping if not picked up in Lloydminster. Oil on gallery wrapped canvas, edges painted to match painting. For Sale: $70.00 plus shipping if not picked up in Lloydminster. A few of the latest things I have done and one that I had forgotten to post about. Size: 7 x 5 inches, not matted, not framed. **Can be matted for an extra $5.00. Still working on pigs and birds. For Sale: $15.00 plus approx. $5.00 shipping if not picked up in Lloydminster. Size: 5 x 7 inches, not matted, not framed. NOT for sale. Commissioned piece. Red is much brighter on the painting, my camera seems to make the red look pinker for some reason. Soft pastels and pastel pencils on Uart 400 pastel paper. I forgot to post this little fellow before. Soft pastels and pastel pencils on Uart 500 pastel paper.